Recently, I've had a crush on everything in orange. From bangles to sweaters, to shoes and clutches, I'm dubbing orange, salmon, coral (what have you) the number one statement color for fall. I've never really been an orange person - it often reminded me of jack o' lanterns and candy corn. 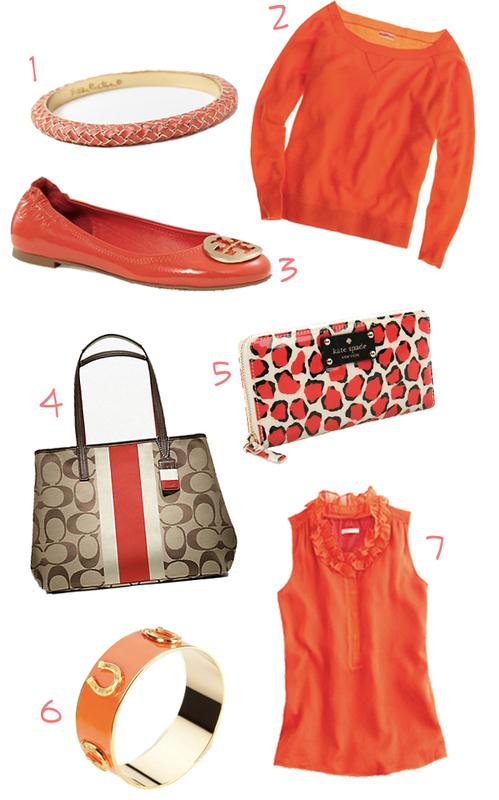 But items that are the perfect shade of orange, like the one's I've found below, are rich, warm, and chic. Plus, I think orange looks exceptional on brunettes! You will definitely see me sporting orange as the leaves change! I can't do orange, being a SEC Gamecock girl, but that bangle is cute. I saw the Naomi top in the store just a bit ago and it is darling! I have always loved orange! Hello, I'm a Gator fan! I also loving orange because growing up in Florida with an awesome tan, it was the best color on me!